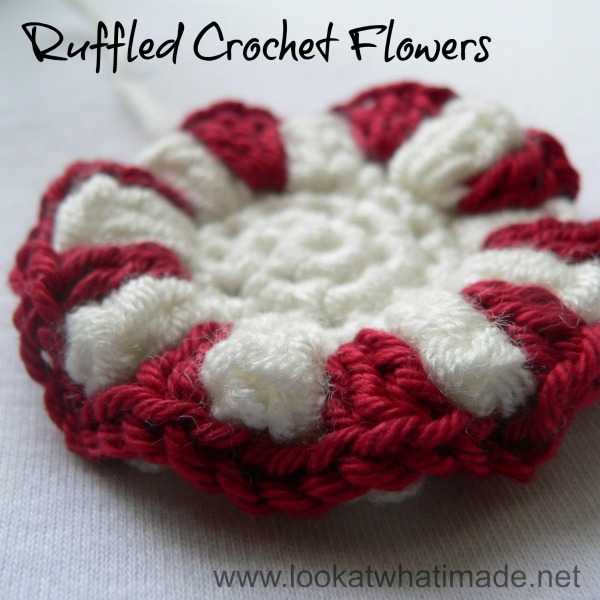 These Ruffled Crochet Flowers are very easy and would make the perfect addition to any project, especially a Christmas project. They take about 15 minutes to whip up and the ruffled edges give them a fair bit of texture. 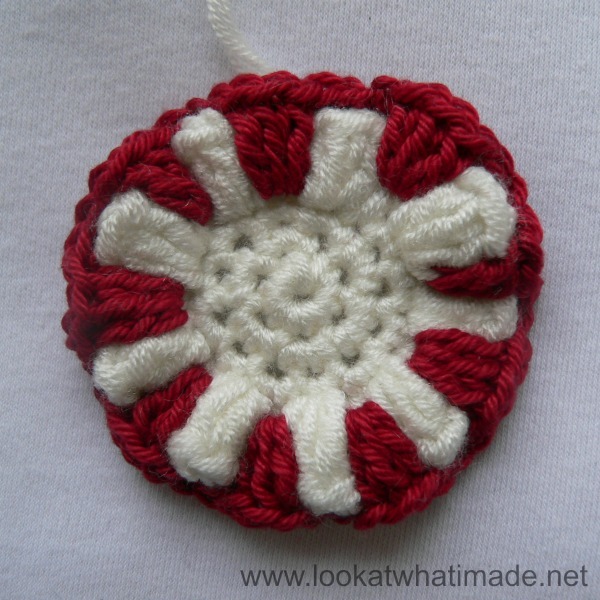 The center is quite plain, but that is easily remedied by attaching a button to the middle of the flower. You can, of course, make these with yellow centers and two-tone petals, but I think this pattern lends itself better to the simplistic two-tone approach I have taken. I hope you have fun with this pattern. If anything is unclear, please feel free to contact me by leaving a comment below. 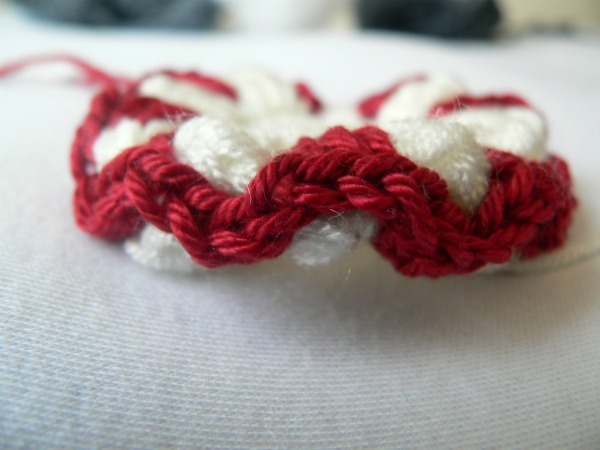 You will need to know how to make a standing double crochet stitch. See this excellent tutorial by Tamara from Moogly if you don’t know what a standing double crochet is or how to make it. Ch 2. *3 x dc in the front loop only of the next st, 3 x dc into the back loop only of the next st* x 9. You will be making your last 3-dc cluster into the back end of the slip stitch join, which is quite tight. Join to the first dc with a sl st. Bind off (Photos 2 and 3). Change to red yarn. 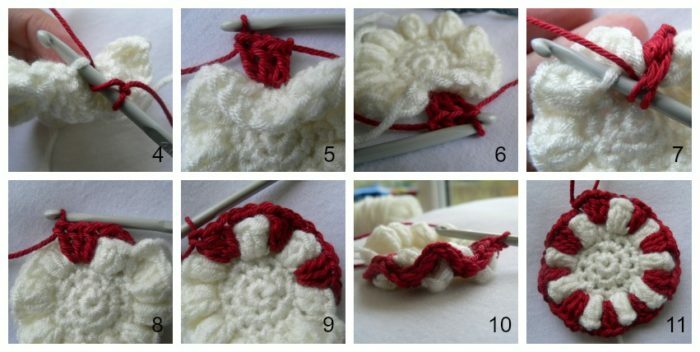 Starting with a standing double crochet (Photo 4), 3 x dc into the back loop only of the first st of round 3 (so behind the first 3-dc cluster of round 4 – see Photos 5 and 6). 3 x dc into the front loop only of the next st of round 3 (so in front of the second 3-dc cluster of round 4 – see Photos 7 and 8). *3 x dc in the back loop only of the next st, 3 x dc into the front loop only of the next st* x 8 (Photos 9 and 10). Join to the first st (the standing double crochet) with a sl st (Photo 11). Bind off and work away your tails of yarn.